This coaching WordPress template offers several website layouts like boxed, full width and full screen. It also has a variety of header and footer formats so you can decide the position of the navigation bar, logo and other elements you want to include in the header. It is a heavily customizable theme whose colour, background, font, menu style, slider settings and logo can be changed to represent your brand. All the changes can be done through theme customizer which allows easy customization in just a few clicks without involving in the coding part. It loads on all browsers and can be translated into any of the various languages it supports. 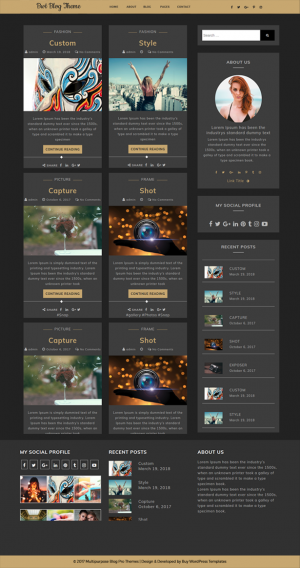 This coaching WP theme is rich in shortcodes, so you can implement functionality like multi-column layout, video and audio posts, instagram feeds etc. in just a single line. It is packed with Font Awesome icons to enhance the site’s look. With this coaching theme comes premium membership wherein you will get customer support for all your theme code related problems and regular theme updates for one year. As colours play a vital role in giving the best professional look, it provides unlimited colours so you have many options. This coaching WordPress template will be your greatest ally in creating an eye-catching, clean, feature-rich and dynamic website. Its smooth and cascading design is sure to attract everyone and its engaging sections will hold them to spend good time on your website. It is a perfect fit for coaching classes, tuitions, mentors, online course providers, online library and other educational websites. It can be used by schools, colleges and universities to vividly describe their services and achievements to get maximum enrolment to your teaching institute. It includes some great plugins like WooCommerce, WPML and Contact Form 7 to help you serve better. 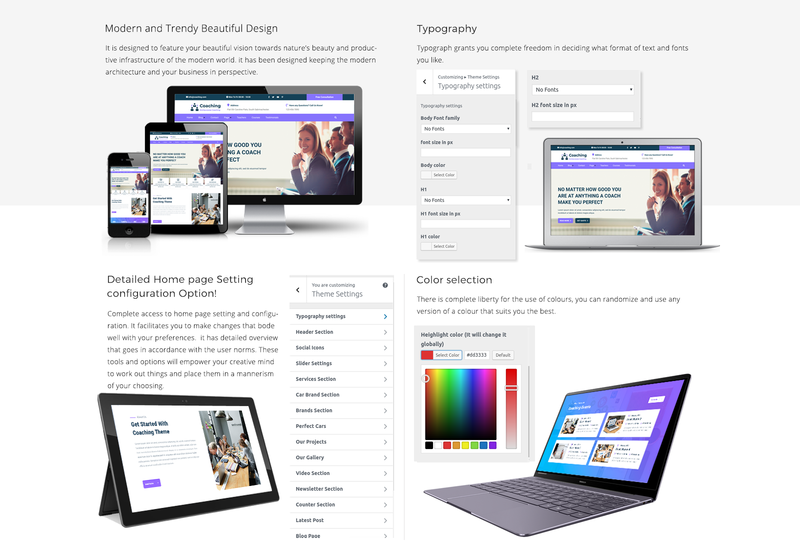 As this coaching WordPress template is fully responsive, your teaching material and guidelines will be just a click away as students and learners can access your website from any device of varying screen size and screen resolution. The theme is compatible with third party plugins so you can integrate the website with LMS and other plugins to include specific functionality that you wish to have in your website. Since the theme follows WordPress standard of coding, it has clean and bug-free code giving a secure website. Newsletter with the help of contact form 7.